DOWNLOAD NOW "sir i sent you half the kidne i took from one woman prasarved it for you tother piece i fried and ate it was very nise i may send you the bloody knif that took it out if you only wate a whil longer"
This is the only letter that most Rippoligists think the real murderer wrote. It was enclosed within a small parcel containing part of a woman's kidney sent to George Lusk of the Whitechapel Vigilance Committee the note was addressed "From Hell"
From Hell is a moody, atmospheric spooky level. Pete Burrows has accomplished what he set out to do, to create the squalid east end of London of the Victorian era, a time of gas lamp shadow alleyways and the worlds first serial killer - Jack the Ripper. As you can see from the screen shots, he has done just that. Game play is quick, and with a little fast thinking you should be able to advance through this level at a good pace. You may be slowed down though just visiting and enjoying the architecture. 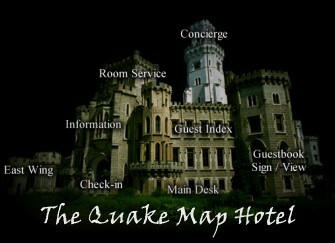 This is a different look from most Quake levels out there, and for that reason alone it deserves a download. If you enjoy this level (and you will) you should also take a look at Pete's very own Jack the Ripper inspired web site. Visit our Concierge for directions to his establishment. From Hell is an engaging first effort, I can't wait to visit more of Victorian London. If you should survive your first visit, pray that Pete will come up with a second! I wouldn't want to meet Jack the Ripper in this alley for all the tea in china. Hmmm, what's that crate say?